COBB Tuning Shortblock - ProSeries SUBARU - Dezod Motorsports Inc - Home of the automotive performance enthusiast since 2002. COBB Tuning Pro Series Short Blocks are SOLD FULLY ASSEMBLED. NO CORE CHARGE REQUIRED! 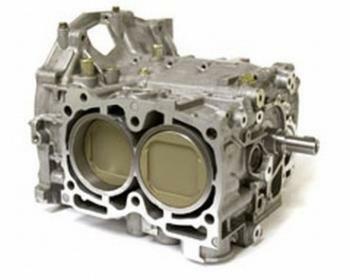 The term Short Block refers to the cylinder block itself, without cylinder heads, water or oil pumps, or any accessories located outside of the cylinder block. Pro Series blocks are built to very exacting standards and are meant for high-end, high power use and the demands of racing. Please note when ordering we need to know specifically which cylinder head you will be using. The COBB Tuning Stage 1 Pro Series shortblock consists of a carefully chosen set of components engineered to be used together. Featuring a 2.65L displacement, we utilized custom designed components built to withstand the high levels of power and abuse you demand from it. Precisely engineered components were utilized internally to maintain the optimal geometry when running extended stroke. Our engines have been tested to the extremes in many forms of professional-level motorsports – as well as demanding street drivers – to prove our ideas work as well in real life as they do in theory. COBB Tuning Short Blocks consist of a carefully chosen set of components engineered to be used together.